The following instruction is part of a series of “limited release” DoD doctrine publications that are not released to the public. In accordance with (IAW) reference a, MISO replaces the term psychological operations (PSYOP). 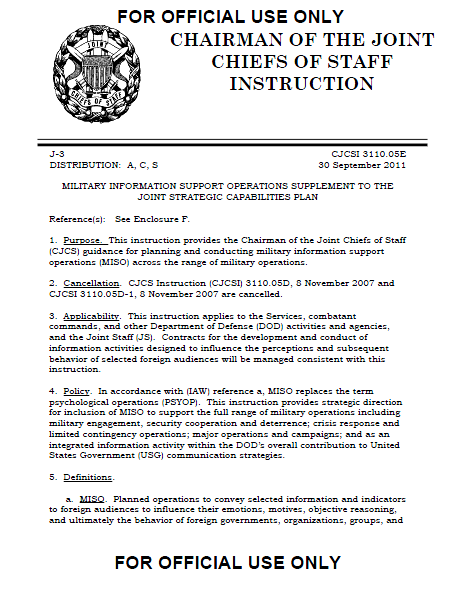 This instruction provides strategic direction for inclusion of MISO to support the full range of military operations including military engagement, security cooperation and deterrence; crisis response and limited contingency operations; major operations and campaigns; and as an integrated information activity within the DOD’s overall contribution to United States Government (USG) communication strategies. 1. General. This instruction supplements and clarifies existing DOD MISO policy and planning guidance, and complies with all directive requirements outlined in the references cited in Enclosure F.
2. Employment. MISO provides the President of the United States, Secretary of Defense (SecDef), CCDR, joint force commander (JFC), and, when directed, Chief of U.S. diplomatic mission, with a unique capability to support the full range of military operations. This includes foreign internal defense, unconventional warfare, military engagement, steady-state operations, security cooperation and deterrence, crisis response and limited contingency operations, and major operations and campaigns including declared war. a. The Purpose of MISO. The purpose of MISO is to influence the perceptions, attitudes, and subsequent behavior of selected foreign audiences as part of approved MISO programs in support of USG policy and military objectives, plans, and operations. b. MISO and Interagency Coordination. DOD MISO should be coordinated with the Interagency and, where appropriate, with coalition partners, to ensure operations are mutually-supportive and complementary. c. MISO and the Covert Action Statute. This instruction does not authorize the CCDR to conduct or provide support to covert action. All MISO conducted by DOD should be in a manner consistent with 50 USC § 413b and the terms of Enclosure C of this instruction. 10. Themes to Avoid (for all programs). a. Ultimatums with no intent or capability to respond in the event of noncompliance. b. Implications that the United States is infringing on sovereignty. c. Themes that favor a specific country, nationality, religion, tribe, ethnic group, or race at the potential perceived detriment of another. d. Messages that promote the legitimacy of organizations or governments committing illegal acts or violations of international or domestic law. e. Themes that have a negative impact on legitimate exercise of peaceful religious tenets. f. Themes that recall or reflect colonialism. g. Themes that imply an inherent moral, cultural, or ideological superiority of the United States to local audiences. h. Unfounded accusations of atrocities. 11. Potential TA List. This is an intentionally broad list of foreign organizations, groups, or individuals that could potentially be influenced. It is neither all-inclusive nor in priority order. The specific TAs will be limited based upon the particular MISO program being executed and will be refined during the MISO development process to identify those foreign TAs that could accomplish the desired attitudinal or behavioral response, in support of MISO and the supported commander’s objectives. Commanders are responsible for ensuring the TAs are limited to those determined to be relevant during planning and execution. t. Civil populations in proximity to U.S. forces or operations.